Sen. Kamala Harris said on "The View" last week that she wasn't ready to make her announcement, and reports said it would come during MLK weekend. Today is MLK Day observed, and it happened. 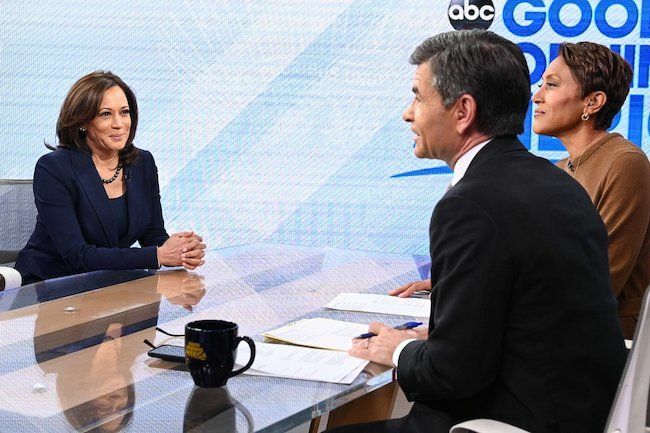 Kamala posted her official announcement that she's running for POTUS across all her social media accounts this AM, then made her first network tv announcement on "Good Morning America" with Robin Roberts & George Stephanopoulos (above). Strategic indeed. Harris' announcement comes following months of speculation. She's a rising star in the party who was elected California's junior senator in 2016 after two terms as the state's attorney general. Yup, she was the top cop, but maintained she can be both pro-progressive reform and do her job as a prosecutor. Kamala's run also sets her up to possibly become the first woman and woman of color to sit in the Oval Office. This marks 47 years to the week that Shirley Chisholm, the first black candidate for a major party's Presidential nomination and the first woman to vie for the Democratic nomination, announced her Presidential run as well. Kamala's logo actually has a salute to Chisholm. The powerful, take-no-sh*t (if you've never seen her in a judicial hearing, google that ish), 54-year-old former prosecutor def has the moxy & brilliance to run for the highest office, and some would even say the clout. But can she get the masses behind her? Some folks are already going the Hillary route and assuming/claiming she's not "for us." The reasons are very subjective, as it depends on what you feel is the role of a prosecutor. Some feel she disproportionately put people of color in jail in her state's attorney general office position. Others feel the numbers aren't disproportionate, and her hard lines abided by were for the greater good of curing big issues like high school dropout rates, drugs, etc. Last night, Kamala and her husband Douglas Emhoff had a pre-announcement dinner at Madeo restaurant in West Hollywood. Sen. Kirsten Gillibrand, D-N.Y., Rep. Tulsi Gabbard, D-Hawaii, and former Housing and Urban Development Secretary Julian Castro have also entered the crowded Dem field of Presidential candidates in 2020. Also expected to announce: Sen. Elizabeth Warren, D-Mass., Sen. Cory Booker of New Jersey and Sen. Bernie Sanders (who is technically an Independent) from Vermont. The masses are pushing - hard - for former VP Joe Biden and former Texas Senatorial candidate Beto O'Rourke to run as well. Is Kamala the Dems' best chance at beating Trump, or even the nomination in the primary? Who knows. President (then Senator) Obama was once a "long shot candidate" as well. Buckle up, buttercups. It's about to be a real bumpy ride.